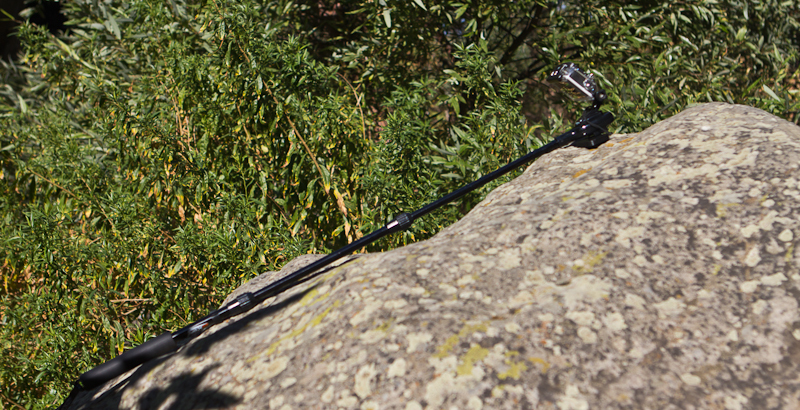 The GoScopeExtreme 2x Telescoping GoPro Pole is a handy tool to use to get more out of your GoPro. While the primary feature of the pole seems to be for the user to capture themselves in the action, I like to find different/more ways to use tools and found it quite useful to get shots of other people. I used it in Joshua Tree National Park to get closer to the action by extending the GoPro far above my head. I also used it to swing closer to the action, getting a dynamic shot. Of course you can also use the pole to get more traditional, include yourself in the shot, type video, but I found its collapsibility (from 17” to 37”) and light weight (6 ounces) makes it a great “portable boom” option. I even used it to get stationary video, by simply resting it on a rock. The downside to using the pole with the camera pointed to get shots of other people is that you can’t see what you’re getting in your shot (this is not a problem if you are using the pole to get selfie video… it’s just like an extension of your arm, aim the GoPro at your own mug and you’re in the shot). One way around it though is if you have a GoPro Black Edition or GoPro Black+, you can use the Android or iPhone app to preview what the camera can see. It’ll eat up battery time, but it may be worth it. I didn’t get give this a test myself because, well, I have an ancient phone that’s neither Android nor iPhone (I’ll eventually upgrade). Over all, I say the GoScope Extreme 2x Telescoping GoPro Pole is a worthwile tool for an action adventure videographer’s kit, and especially if said videographer goes on a lot of solo trips. 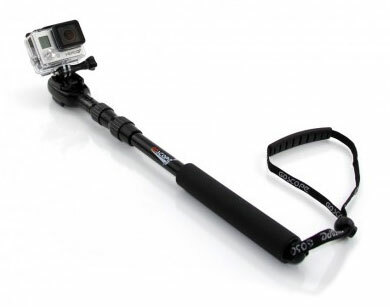 Disclosure of Material Connection: I received a GoScope Extreme 2x Telescoping GoPro Pole for free from GoScope as coordinated by Deep Creek Public Relations in consideration for review publication.